Dr. S.J. 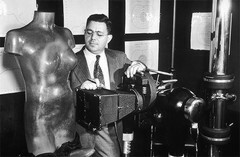 Hawley using a Westinghouse Deep Therapy X-ray in 1940. Dr. Hawley was a roentgenologist at Geisinger Memorial Hospital in Danville, Pennsylvania.